Preeta takes charge and decides to trap Sherlyn. What is her game plan? 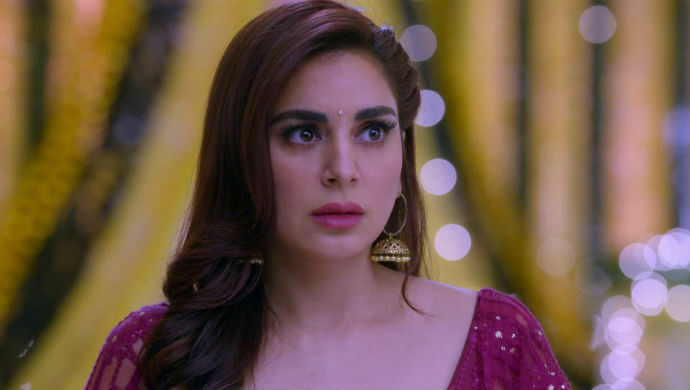 In the last episode of Kundali Bhagya, we saw Karan, Preeta and the rest getting shocked after catching Sherlyn and Rishabh together in bed. Karan confronts Rishabh and the latter denies getting intimate with Sherlyn, saying that someone must have mixed bhaang in his drink and that he’s innocent. Karan says he will stand by him no matter what. Later, the Luthras confront Rishabh and blame him for the incident, while defending Sherlyn. Karan calls out their hypocrisy and says that both were equally involved and hence Sherlyn should be scolded too. She on the other hand breaks down claiming that Rishabh made her drink bhaang forcefully and took advantage of her. Karan defends Rishabh but his family won’t hear any of it. The episode ends with Rakhi deciding that he only solution to fix this problem is to get Rishabh and Sherlyn married within 15 days. In tonight’s episode, we saw Rakhi being adamant on her decision to get the two married and her husband convincing her to change her decision. Sherlyn thinks that she needs to act more melodramatic to make Rakhi stick to her decision. She shocks everyone, by refusing to marry Rishabh. She storms off crying and waits for someone to approach her and gets furious when no one does. Instead Prithvi approaches her and yells at her for spoiling the plan by refusing to marry Rishabh. Sherlyn tells him that she carried out the act deliberately and Prithvi tells her it was a stupid move. She however convinces Prithvi that this plan is perfect as now she will make the Luthras make her marry Rishabh instead of being the other way round. The two get shocked seeing Sanjana in the room, who has been overhearing their conversation all along. She slaps Prithvi. Meanwhile, Karan tries his best to convince Rakhi to change her decision, but she is adamant. She tells Rishabh to make peace with Sherlyn and make her say yes to the wedding. Karan makes a sly move and says that since everyone listens to Preeta, she should go and convince Sherlyn. Preeta catches the hint and realizes that he wants her and not Rishabh to approach Sherlyn. Preeta asks Rakhi if she can go and talk to Sherlyn and she agrees. Meanwhile, Sanjana scolds Prithvi and warns him to keep away from Sherlyn. He asks him why he’s meddling in their lives again, especially now that Sherlyn is about to marry Rishabh. Prithvi assures Sanjana that he wants the same for Sherlyn. He tells her that Rishabh doesn’t wish to marry her. Prithvi further narrates his plan and asks Sanjana whose side she is on. She says she wants Rishabh to be her son-in-law by hook or crook. Preeta on the other hand, gets ready to approach Sherlyn and Karan asks her to think wisely have a plan in mind. The episode ends with Preeta saying that she knows how she will make Sherlyn speak the truth. What is Preeta’s next move? How will she trap Sherlyn? Stay tuned for all the updates! Watch Arjun Rampal's Smashing Comeback As A Pilot In ZEE5's Original Series The Final Call!